Forward-thinking historians almost come close to forward-thinking comedians in terms of their enthusiasm for podcasting. Perhaps it stands to reason, since excellence at either pursuit, different as they may seem, demands no small degree of memory and articulateness. We've covered several sterling examples of the historical podcast right here on Open Culture, including The History of Rome, The History of Byzantium, and The History of Philosophy Without Any Gaps. My own historically-minded podcast explorations have led me to everything from A History of the World in 100 Objects to My History Can Beat Up Your Politics. If you prefer to take your history lessons through a pair of earbuds, technologically savvy history professionals and passionately fascinated amateurs alike have stepped up to fill the need. Rob Monaco, one of the newest entrants into the game, has taken on perhaps the most ambitious history podcast challenge of them all: to tell the entire Podcast History of Our World. "The genesis of the show happened late one night after quite a few Dogfish Head Midas Touch brews were consumed with this podcaster's longtime good buddy," writes Monaco on the podcast's about page. "As I was a freshly unemployed social studies teacher with a masters degree and nothing to do, my amigo suggested that I take up the microphone and start making my own show." Beginning with an episode on the earliest creation myths, embedded above, he goes on to discuss the dawn of man, the third dynasty of Ur, the ancient Hebrews, King Solomon, and so on, showing no signs of slowing in his mission to, eventually, get up to the present day. No need to rush him, though, since, like any historian worth his salt, amateur or professional, he understands that telling history well means telling a story well. "Podcasting is a beautiful medium that gives someone like me a chance to reach out and share my love and knowledge of history and culture to a huge audience," he writes, "an audience that even ten years ago, I would not have been able to reach without the backing of traditional media. And that's incredible." If he successfully podcasts the whole history of our world, well, that's even more so. 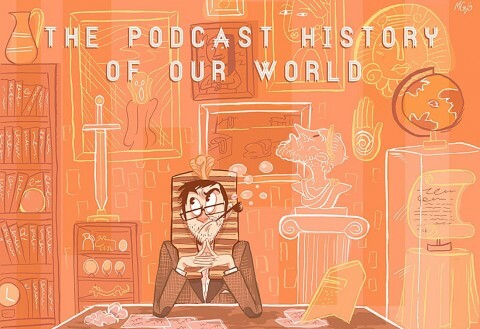 The Podcast History of Our World is also available on iTunes.